I think Microsoft should be given credit for single-handedly stimulating the economy. Consumer spending is down, most of the Black Friday deals are lame, but I’m purchasing things that have been on my Wish List for years. Why? 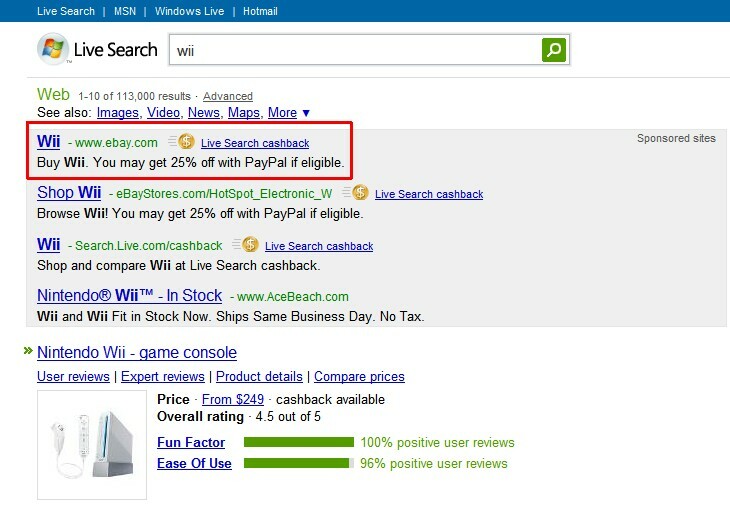 Because I can get 25% cash back if I purchase an Ebay Buy It Now item and pay for it using PayPal. This discount applies only to buy-it-now items purchased with PayPal on Ebay. Go to http://www.live.com and search for something like “wii”. You should see (at the top of the page in the Ad area) something that says “Live Search cashback” and an Ebay link and the 25% off offer. Click the Link. Once on Ebay, search for whatever you want (Wii, Nikon D90, MSI Wind, Sonos ZP90, etc.) and filter by “buy-it-now” items. Purchase the item with buy-it-now and PayPal, and get 25% off. If the seller uses a third-party checkout, then the offer is not valid and you will be warned that the offer does not apply. If they do use PayPal, the amount of the discount will be shown on the checkout screen before you pay. This offer is good for up to $200/purchase and $2000/year. The only catch is that you have to wait 60 days to get the 25% refund (to make sure you don’t return the item.) This is good for up to 12 purchases on Ebay and then you are no longer eligible. Does anybody know if this still works? It no longer works. You may get a small discount (2%) at certain stores (CircuitCity.com) from time to time but the big discounts are gone. Got my rebates the other day from holiday purchases! A couple had been instant but the big ones took the 60 days. Great deal! I never would have bought that much stuff w/o it. After a weird and unexplained error, I finally got all of my payments even though it had been longer than 60 days. Well, almost all of them. There is still one pending and I have no idea why the payment has “failed” when all of the others cleared with no problems.